Enjoying apples in the fall doesn’t have to be #basic. For proof, try one of these unique takes on the iconic fall treat. 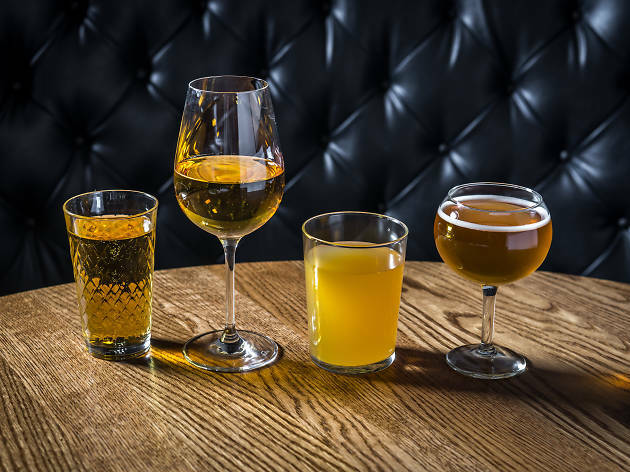 For a city packed with practically everything, Gotham is surprisingly scarce on cider bars. Wassail (162 Orchard St; 646-918-6835, wassailnyc.com) is one of the few applecentric dens, serving more than 90 varieties. Set to join those fruity ranks in October is Brooklyn Cider House (1100 Flushing Ave, Brooklyn; brooklynciderhouse.com), a Bushwick spot complete with an in-house cidery and bar. 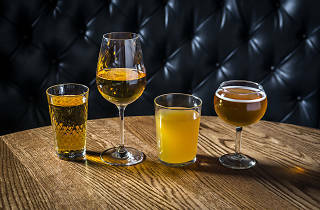 For a more refined cider experience, head to Perrine (The Pierre, 2 E 61st St; 212-940-8195, perrinenyc.com) to sip on Them Apples ($18), a cocktail with sparkling cider, Cointreau and apple brandy. Then hitch a ride downtown to aRoqa (206 Ninth Ave; 646-678-5471, aroqanyc.com) and order the Cider House Rules ($14), a triple threat of hard cider, applejack and apple brandy. Take advantage of the classic sweet-and-savory pairing of pigs and apples at Clancey (79 Clinton St; 917-388-3575, clanceynyc.com) by ordering its Tomahawk pork chop brined in Downeast cider ($22) or at Westville (various locations; westvillenyc.com), which doles out a cider-marinated ham sandwich alongside a cucumber salad dressed in house-made apple cider vinaigrette ($13). For a tried-and-true apple cider doughnut ($2.25), stop by Carpe Donut (various locations; 917-509-5119, carpedonutnyc.com), a roving food truck known for its all-natural treats, or sink your fork into the heartier doughnut tower ($12) at Tavern62 (135 E 62nd St; 212-988-9021, tavern62.com), David Burke’s upscale gastropub boasting stacked glazed apple cider doughnuts.